Vermont’s US Senator Patrick Leahy has a passion for rail. For a state that that is hungry for improved public transportation, this is very good news. On Sept. 12, Leahy’s Field Office Representative, Chris Saunders, visited the Budd cars in Barre to ride them first-hand. Like everyone who’s seen the Budd cars in person, Saunders was impressed. In fact, he said he’s confident that Senator Leahy will support AllEarth's Budd car project. In 2009, the American Recovery and Reinvestment Act (ARRA) funded upgrades to most of the New England Central Railroad (NECR) line in Vermont, installing welded rail for a smoother ride. This includes a $50-million-dollar Federal investment, matched by VT and the NECR. This investment hasn’t yet been leveraged; no additional freight or passenger service has been added on the NECR main line from St. Albans to White River Jct. and points south since these track improvements were installed. Sen. Leahy’s support for rail began in the 1980s when Amtrak suspended service on the former Montrealer train due to poor track conditions. Leahy worked with former Massachusetts Representative Silvio Conte to secure $5 million to rebuild the track between Brattleboro and Windsor. In the 2000s, Leahy successfully worked to secure millions in rail improvements south of the Burlington region. He persuaded his colleagues in Congress to fund a 10 year, $70 million investment to improve rail service on the Western Corridor between Rutland and Burlington. 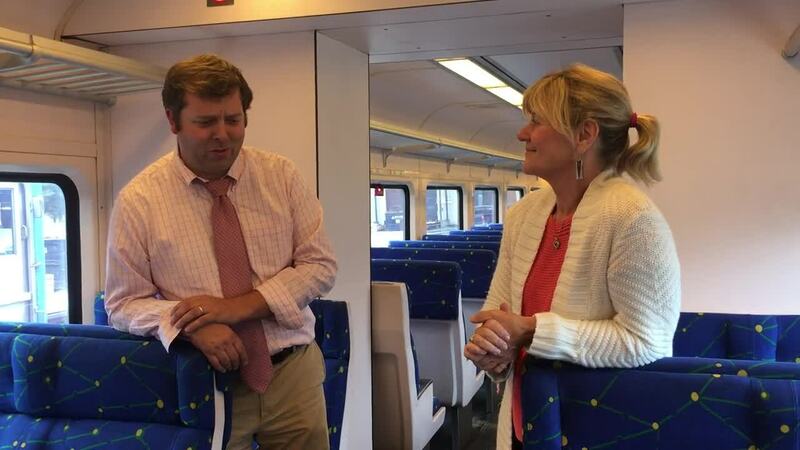 “Senator Leahy has been thinking a lot about passenger rail and how Vermont can invest to help people commute and travel,” Saunders said. Leahy has seen the benefits of a strong, vibrant rail transit system in other parts of the US and around the world, and he has worked hard to bring that capacity to Vermont. More recently, Leahy has worked to restore direct rail service between Montreal and Vermont. He has worked at the state, federal, and international levels to restore this important service. He also helped initiate investment in Amtrak safety improvements for the Ethan Allen and Vermonter routes. It makes sense, then, that Leahy supports the Budd car initiative. “We have some great infrastructure for passenger rail,” Saunders said. He suggested Vermont is poised to reap the benefits of these investments by launching pilots of community rail and other passenger rail services.